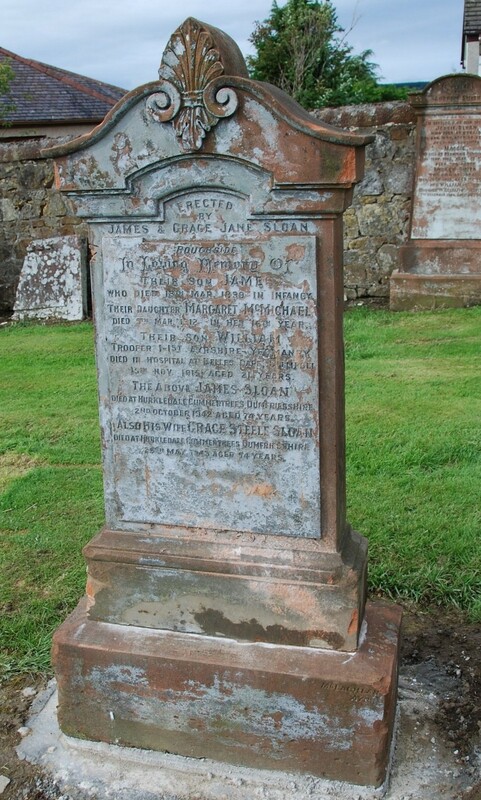 William Sloan was the the son of James Sloan, farmer at Crofthead, Sorn and Charlottte Hood. In 1867 he married Jane Harvey daughter William Harvey, landed proprietor and farmer, Miid Heillar, Sorn and Agnes Clark. Together William and Jane had four sons, including eldest son James, all born at Sorn. The family moved to Roughside farm , New Cumnock some time beween 1885 and 1891 at which time the tenant was Peter Sloan, Knockterra, Old Cumnock and possibly a family relative. William later moved to Castlemaines farm, New Cumnock while eldest son James continued to farm at Roughside. In 1893 James married Grace Jane Steele the daughter of James Steele, farmer Merkland, New Cumnock and Margaret McMichael. Together they had six children including eldest son William who was born at Roughside farm on 22nd March 1894. On the outbreak of the First World War, the Regiment was one of the fastest to react to the mobilisation order following which the Regiment joined the Lowland Mounted Brigade and remained in the United Kingdom, on home defence duties, until 1915. The Regiment finally deployed overseas in September of that year, where it took part in the Gallipoli landings, serving as dismounted infantry. We deeply regret to learn that Tpr. William Sloan, of the Ayrshire Yeomanry – son of Mr. James Sloan of Roughside, and grandson of Mr. William Sloan, Castlemains, – has died at the Dardanelles.